James Jacques Joseph Tissot (French painter and illustrator, 1836-1902), "Joshua and the Angel before Jericho" (1896-1900), watercolor. Larger image. You may have known God as Almighty God. But did you ever think of him as Mighty Warrior? The Israelites did. In this chapter we're exploring the powerful and mighty character of God. He is ´El Shaddai, Almighty God. He also has military prowess as the LORD of Hosts/Armies (Yahweh-Sabaoth), a Mighty Warrior, and the LORD our Banner (Yahweh-nissi). In this chapter we'll consider the offensive names and metaphors of our Conquering God. In chapter 7, "God Our Stronghold," we'll consider some of the defensive aspects of his character. "Almighty God" (´El-Shaddai) is the next great title by which God reveals himself to Abraham. The term appears as "´El Shaddai" ("Almighty God") seven times, and standing alone as "Shaddai" ("the Almighty") 41 times in the Old Testament and 9 times in the New Testament (as Greek pantokratōr; 2 Corinthians 6:18; Revelation 1:8; 4:8; 11:17; 15:3; 16:7, 14; 19:15; and 21:22). The derivation and meaning of Shaddai (shadday) has sparked debate. "Almighty" is the way the early Greek Septuiagint translators of the Old Testament, understood it. They translated the Hebrew noun shadday with the Greek word pantokratōr -- literally "he who holds sway over all things, the ruler of all (from pas, "all" + krateō, "to have power, be master of, rule"). They linked shadday with the verb shādad, "to destroy, overpower." Thus Shaddai would mean "He who destroys, over powers. "1 This is the traditional meaning adopted by most modern translations. Other possibilities are "Sufficient One"2 and "God of the Mountain"3 or "God of the Steppe. "4 I believe that the traditional understanding as "Almighty" from shādad is probably sound, so I see Shaddai as meaning something like "all mighty, all powerful, omnipotent." God first revealed himself as ´El Shaddai to both Abraham and Jacob. In order to explore the depths of each aspect of God's blessings toward us, we're dividing the titles and metaphors describing God's military prowess into three different sections, even though they obviously overlap with each other. An even more common title for God in the Old Testament is as "The LORD of hosts" (Yahweh-Sabaoth), which appears nearly 250 times. The plural Hebrew noun is ṣebā´ōt, "armies, hosts." It's quite possible that Yahweh-Sabaoth became a technical term that referred to Yahweh the mightiest Warrior or Yahweh the all-powerful King,6 which explains the consistent NIV translation as "LORD Almighty." However you take the term, Yahweh-Sabaoth portrays God as a mighty war commander, able to bring to bear innumerable hosts or armies wherever and whenever he desires. 15The commander of the LORD's army replied, 'Take off your sandals, for the place where you are standing is holy.' And Joshua did so. 6:1Now Jericho was tightly shut up because of the Israelites. No one went out and no one came in. The Commander's words are nearly identical to those of Yahweh to Moses out of the burning bush a full forty years before (Exodus 3:5). The Commander is none other than God himself -- God the Warrior. When Joshua challenges him with, "Friend or foe?" why does the Commander answer, "Neither"? Isn't he for the cause of Israel's army? No. Israel's army must be enlisted in his cause. He is the Commander, not they. When things are difficult we wonder, "Is God on my side?" Wrong question. The more appropriate question is, "Am I on God's side?" Some people argue that it could not have been God the Father who Joshua saw; that it must have been the pre-incarnate Jesus. Scripture isn't specific in our passage, but clearly it is God's presence Joshua feels and he knows it full well. Like his forefathers Abraham, Isaac, and Jacob, God had now appeared to him and he lies prostrate on the ground before his Lord. When Joshua gets up from the ground the Commander is gone. But Joshua can now go into battle assured, because he knows that God will be with him who told him, "Be strong and courageous. Do not be terrified; do not be discouraged, for the LORD your God will be with you wherever you go" (Joshua 1:9). God has made that same promise to us in the New Testament, "I will never leave you or forsake you" (Hebrews 13:5). But sometimes we doubt. Where are you God? Where are you when I need you? Have you left me? Will you save me from this thing I am going through? The Commander was at the Battle of Jericho was with Joshua. And though unseen, he crumpled the walls, destroyed the city, and crushed the army, leaving only a little for Joshua's army to finish. Our Commander is with us, too. Q1. (Joshua 5:13-15) Why did the Commander say he was on neither side? What is the significance of this? What did Joshua feel like during this encounter? How did he feel after this encounter? "Jacob went on his way, and the angels of God met him. And when Jacob saw them, he said, This is God's host: and he called the name of that place Mahanaim" (Genesis 32:1-2, KJV). This phrase "the LORD of hosts" is used in most translations. The NIV translates it "the LORD Almighty," which captures some of the greatness and glory of this phrase, but unfortunately loses the military sense of the term. Twice in the KJV New Testament the name is given as "Lord of Sabaoth" (transliterating the Hebrew) in Romans 9:29 and James 5:4. We live in an era which has few military heroes. Our culture and press tend to distrust and deride the military, except in times of war when courage and bravery and the willingness to stand up against wrong is all that keeps civilization from tyranny. In America it has been nearly 150 years since we have had a war on our own soil. Except for rare riots, our cities are peaceful. No bandits roam the hills and valleys. Law and order prevail. The Ancient Near East was much different. War might come to walled city two or three times in a person's lifetime, with devastating results. If you lived in an outlying village, your only defense would be to escape to the nearest walled city. It was a society which lived close to destruction, a society in which warriors were valued. The LORD of hosts is not just an expression of greatness, but of armed might willing to punish evil and uphold righteousness. The message of this passage in Joshua, and the entire Bible, for that matter, is that God is a mighty Warrior who will judge righteously and punish wrong. If we believe God is too loving to punish the wicked, then our Bible knowledge is thin indeed. He is mighty. And his mere presence is enough to win the battle, for the "battle is the LORD'S" (1 Samuel 17:47; Exodus 14). Elisha the prophet heard from God the military plans of the king of Aram and passed them on to the king of Israel, so that the Israelite army could elude its enemies. The king of Aram heard that Elisha was the secret of Israel's success and sought to kill him. Elisha and his servant were in the city of Dothan when the king of Aram arrived with his army. In the morning Elisha's servant looks out and sees the city surrounded with an army, and horses, and chariots. He comes terrified to Elisha. "Do not be afraid," Elisha tells him. "Those who are with us are more than those who are with them." I can imagine the servant looking around, unable to see any opposing army. He looks at Elisha with terror still in his eyes, so Elisha prays, "O LORD, open his eyes so he may see." Then the servant looked "and saw the hills full of horses and chariots of fire all around Elisha" (2 Kings 6:15-17). The Commander and his armies are with us, whether we see them or not. Q2. (2 Kings 6:13-17) Why was Elisha's servant afraid? What was the difference between Elisha and his servant? What does it take for our eyes to be opened? How can 1 John 4:4 strengthen you in your spiritual battle? Jesus is captured by a small contingent of troops in the Garden of Gethsemane. Peter draws his sword to defend his Master. Jesus tells him to put it away. "Do you think I cannot call on my Father, and he will at once put at my disposal more than twelve legions of angels?" (Matthew 26:53). But that day the hosts of heaven were not called to his defense. They looked on aghast as they saw their Commander whipped and beaten, mocked and finally crucified. Jesus would not call them for this battle. This one he must fight alone, the Righteous for the unrighteous, to bring us to God, the Lamb of God who takes away the sin of the world (1 Peter 3:18; John 1:29). He died alone on the cross. The disciples mourned him. Mary helped wash his body as it was laid in the stone-cold tomb, and darkness fell. But the third day, early in the morning, as the sun was just beginning to rise, he stepped forth a Victor. And in this battle, the Scripture records, "he disarmed the powers and authorities ... made a public spectacle of them, triumphing over them by the cross" (Colossians 2:15). "... a white horse, whose rider is called Faithful and True. With justice he judges and makes war.... He is dressed in a robe dipped in blood, and his name is the Word of God. The armies of heaven were following him, riding on white horses and dressed in fine linen.... He treads the winepress of the fury of the wrath of God Almighty. On his robe and on his thigh he has this name written: 'King of kings, and Lord of lords'" (Revelation 19:11-16). Here the Commander is clearly Jesus Christ the Victor. We've looked at Almighty God, LORD of hosts, and Commander of the army of the LORD. Another metaphor in Scripture is Mighty Warrior. Rather early in Israel's history we find a very vivid statement in the Song of Moses celebrating God's victory over the Egyptian army at the Red Sea. "The LORD is a warrior; the LORD is his name." (Exodus 15:3, NRSV). "Warrior" here is made up of two words, îsh, "man" and milḥāmā, "war, battle." Several modern translations (NRSV, NIV, NASB, New Jerusalem Bible) render it quite appropriately as "warrior." Others retain the more literal but less vivid phrase "man of war" (KJV, RSV). When God calls Israel to arms against an enemy, it is because of the enemy's moral degradation. In such conflicts, it is the Lord who does battle on Israel's behalf. The battle is the Lord's! Nevertheless, the soldiers of the physical army must also join the battle and fight alongside the Lord. Even though their land has been deeded to them as an inheritance, they must conquer it in battle (Exodus 23:27-33). by the name of the Shepherd, the Rock of Israel." A similar idea is found in Deuteronomy 7:21: "Have no dread of them, for the LORD your God, who is present with you, is a great and awesome God" (NRSV) or "Mighty God and terrible" (KJV). Just what is the significance of this? Banner is the Hebrew noun nēs (nissi is the first person possessive, "my banner"). It is apparently derived from a root meaning "raised, displayed, prominent." It means "signal pole, standard, ensign, banner, sign" used in war to signal the troops and rally them in battle.13 In this instance, perhaps "signal pole" might be a better translation than "banner," because Moses was using his rod as a rallying point for the troops. But since troops in all but the most modern warfare used flags as rallying points, perhaps "banner" conveys the idea effectively to our time. You may remember the story of Francis Scott Key's national anthem, "The Star Spangled Banner." In the War of 1812, battle raged as a British warship shelled one broadside after another against Fort McHenry defending Baltimore. It wasn't immediately apparent to Francis Scott Key if the American fort had been taken or not, whether or not the colors had been struck. Finally, from the light of battle he could see that the flag still flying: ".... And the rockets' red glare, the bombs bursting in air, Gave proof thro' the night that our flag was still there." It's that kind of sentiment that Moses expressed toward Yahweh himself at the battle with the Amalekites. Of course, Yahweh-nissi was a name given to an altar, not a name used to address God in Scripture. But the name is closely associated with Yahweh, in that it describes one of his characteristics -- Yahweh my banner, the one I look to in battle as my rallying point. The staff in Moses' hands, the "rod of God" was that pole or standard lifted high that won the battle for Israel -- Yahweh-nissi. Q4. (Exodus 17:9-16) In what sense was Moses' rod like a signal pole in this battle? In what sense is the LORD our banner in the battles we face? The battle is the Lord's. He will fight for us. We, too, must prepare ourselves to fight. The first principle is that the Lord will fight for us. Again and again the Israelites made the mistake of trusting in their own military might to save them. Again and again, God taught them the important lesson: the battle is the Lord's. He will fight for us. See also Exodus 14:14, 25; Deuteronomy 1:30; 3:22; Joshua 10:14, 42; Jeremiah 21:5; Nehemiah 4:14; and 2 Chronicles 20:29. Q5. How should the knowledge that the battle is the Lord's affect the way we approach life? In what way do both timidity and brashness get it wrong? Are there any instances in which the Lord will not fight our battles? We will follow our God, the Mighty Warrior, Almighty God (´El-Shaddai), the Commander of the Armies of the LORD, the LORD of Hosts (Yahweh-Sabaoth). And he shall win the battle! Almighty God, we put our trust in your might and power. We feel safe from the enemy with you on our side. Help us to arm and be part of the battle, your battle, ever trusting in you, the Commander of the armies of the LORD. In Jesus' mighty name, we pray. Amen. There are many, many songs on this theme. Here are just a few. If you have a song in this category to suggest, please let me know (www.joyfulheart.com/contact/). "We Gather Together" ("... we all do extol thee, thou leader in battle"), words, anonymous Dutch hymn (16th century) translated by Theodore Baker (1894), music Dutch folk song. Victor P. Hamilton, shādad, TWOT #2333. Also Hamilton, The Book of Genesis, Chapters 1-17 (New International Commentary on the Old Testament; Eerdmans, 1990), pp. 462-463. See also David W. Baker, "God, Names of," DOTP 361. This meaning is also suggested by the wordplay in Isaiah 13:6, "Wail, for the day of the LORD is near; it will come like destruction (shōd) from the Almighty (shadday). 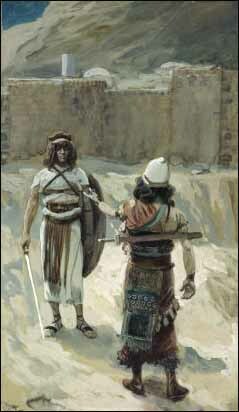 John I. Durham (Exodus (Word Biblical Commentary, Volume 3; Nelson, 1987), p. 76-77) acknowledges that the word meaning is uncertain but sees a strong case made by MacLaurin that "Shaddai's primary character is one of power and military prowess," and that for the Hebrews his "predominant characteristic was his covenant-making with men. "Sufficient One" is an ancient suggestion from Aquila and an ancient Greek translation by Symmachus rendering shadday with the Greek noun hikanos, "sufficient," taking shadday as the relative particle she "who" + the adjective day, "enough, sufficient." Hamilton (Genesis, p. 462) cites Babylonian Talmud, Hagigah 12a. This is a more recent attempt is to connect shadday with the Akkadian word, shadu "mountain." Hamilton (TWOT #2333) cites studies by Albright (1935) and others. See Frank M Cross, ´el, TDOT 1:256-257. E.A. Speiser, Genesis (Anchor Bible; Doubleday, 1964), p. 124, sees phonologic difficulties with Albright's etymology and concludes, "A satisfactory explanation of this term is yet to be proposed...."
Bêl sadê, "Lord of the steppe" was the most common title given to the god Amurru in early Babylonian texts. Hamilton (Genesis, pp. 462-463) cites Bailey (1968), Ouellette (1969), and deVaux.(1978). Genesis 15:7; 28:13; Exodus 6:2, 6-8, 29; 7:17; 10:2; 12:12; 14:4; etc. ´El Shaddai is used three additional times in Genesis as God reveals himself: Genesis 28:3; 31:13; and 48:4. John E. Hartley, ṣābā´, TWOT 1865b. Hartley explains: "Some have proposed that ôt is an abstract plural ending (cf. GK 124d,e); then ṣebā´ōt is a noun in apposition to Yahweh: Yahweh the mightiest Warrior or Yahweh the all-powerful King. Therefore Yahweh ṣebā´ōt has become a technical term. The LXX supports this possibility by translating ṣebā´ōt with sabaōth (especially in 1 Samuel and Isaiah; cf. Romans 9:29; James 5:4) and pantokrătōr 'Almighty,' 'All-Powerful.' ... Most often the word ṣebā´ōt follows Yahweh around 261 times; after ´ĕlôhê, 18 times, after ´ĕlôhîm, 6 times." Mettinger says: "The Sabaoth name designates God as the heavenly King, and the element ṣebā´ōt directs our attention to the heavenly hosts around the throne of God," with particular reference to the heavenly King on his cherubim throne -- heavenly hosts who worship God, serve in his heavenly governmnent, and carry out his assignments on earth (Tryggve N. D. Mettinger (translated by Frederick H. Cryer), In Search of God: The Meaning and Message of the Everlasting Names (Philadelphia: Fortress Press, 1988), pp. 134-135). John N. Oswalt, gābar, TWOT #310b. Ronald B. Allen, `āras, TWOT #702b. Robert L. Alden, ´br, TWOT #13c. It may also be related to the Ugaritic ´br "bull" or "humped buffalo." ´Ĕyālût, "strength," from ´ĕyāl, "strength." It is translated "strength" by KJV, NIV, and NJB, "help" by the NRSV. The connotation of help is supported by the Syriac from which this word is probably borrowed, the Ugaritic cognates suggest "strength" (Thomas E. McComiskey, ´ĕyāl, TWOT #79a). Brevard S. Childs, The Book of Exodus (Westminster Press, 1974), pp. 311-312 argues that in verse 16, "throne" (kēs) should be emended to "banner" (nēs) due to a probable textual corruption, in order to make better sense of the verse (adopted by the RSV and NRSV). However as it is read, it is a difficult verse to understand completely. Marvin R. Wilson, nāsas, TWOT #1379a. "In the Old Testament, nēs generally means a rallying point or standard which drew people together for some common action or for the communication of important information. This usually happened on a high or conspicuous place within the camp or community. There, a signal pole, sometimes with an ensign attached, could be raised as a point of focus or object of hope.... Realizing that the LORD was the Banner around which Israel had rallied, Moses called the altar Jehovah-nissi (the LORD is my banner)."